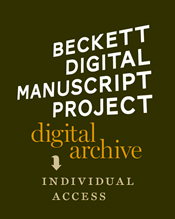 The Beckett Digital Manuscript Project aims to contribute to the study of Beckett’s works in various ways: by enabling readers to discover new documents and see how the dispersed manuscripts of different holding libraries interrelate within the context of a work’s genesis in its entirety; by increasing the accessibility of the manuscripts with searchable transcriptions in an updatable digital archive; by highlighting the interpretive relevance of intertextual references that can be found in the manuscripts. The Project may also enhance the preservation of the physical documents as users will be able to work with digital facsimiles. I hope this is the wave of the future and that more libraries and estates will enter into projects such as this one. Unfortunately, the Beckett project limits access to those willing to pay annual fees starting at €25 and going upward. I’d love to see something like a day- or week-pass offered. Nevertheless, I encourage Vertigo readers to go check out the partially-locked, albeit still impressive demo. If the demo leaves you asking still more questions, read the Manual and the Technical Documentation for a much more detailed sense of how the tools work. Equally impressive is the project’s dedication to transparency, seen not only in the thorough documentation noted above, but also in the excellent section on Editorial Principles. Marker and Sebald are both pessimistic about the trajectory of civilization and the seeming inability of human nature to overcome its own destructive nature, yet neither manages to be nihilistic. What interests me is that they both gnaw away at the prospect of some kind of redemption, even if it’s against their better judgment. Sans Soleil begins somewhat optimistically with the narrator saying “The first image he told me about was of three children on a road in Iceland, in 1965. 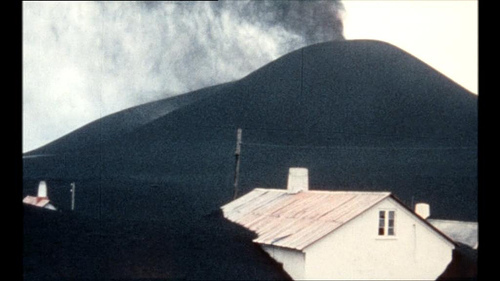 He said that for him it was the image of happiness.” However, at the end of the film we learn that the village in the background of this photograph (on the Icelandic island of Heimaey) was buried by a volcanic eruption. Nature condemns optimism, it seems. “How far is it from the point where we find ourselves today back to the late eighteenth century, when the hope that mankind could improve and learn was inscribed in handsomely formed letters in our philosophical firmament?” Sebald asks in his essay An Attempt at Restitution. As we know, Sebald despaired constantly only to have some chance meeting or coincidence give him a restorative burst of energy and renew his boundless sense of curiosity. When he posed the question “So what is literature good for?” he made his now often-quoted statement that “only in literature, however, can there be an attempt at restitution over and above the mere recital of facts, and over and above scholarship.” I’m inclined to think there is an emphasis on the verb attempt. Marker despairs, too. “We do not remember. We re-write memory much as history is written.” Faced with “the amnesia of the future that history distributes through mercy or calculation to those it recruits,” the in Sans Soleil is a Diogenes searching for something authentic. 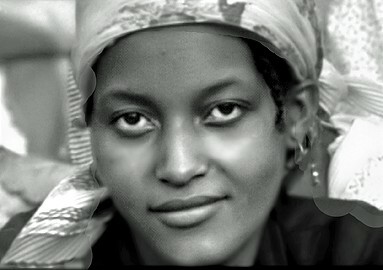 Marker returns several times to a film clip of a woman in Guinea-Bissau. The narrator recites “I see her, she saw me, she knows that I see her, she drops me her glance, but just at an angle where it is still possible to act as though it was not addressed to me, and at the end the real glance, straightforward, that lasted a twenty-fourth of a second, the length of a film frame.” The real glance. Straightforward. This fragile one-twenty fourth of a second momentarily undermines the cynicism that otherwise permeates the film. This human connection may not be enough to save the world from destruction, it may not even offer hope, but, if nothing else, it seems to be a reason to continue. I can’t go on, you must go on, I’ll go on, you must say words, as long as there are any, until they find me, until they say me, strange pain, strange sin, you must go on, perhaps it’s done already, perhaps they have said me already, perhaps they have carried me to the threshold of my story, before the door that opens on my story, that would surprise me, if it opens, it will be I, it will be the silence, where I am, I don’t know, I’ll never know, in the silence you never know, you must go on, I can’t go on, I’ll go on.